Our commitment to sustainable forestry in natural forests traces back 33 years. We embrace the principles of Forest Stewardship Council® certification. Spurred by compelling questions about sustainable foresty, loggers, foresters, environmentalists, and sociologists came together in the first General Assembly to form the FSC® in 1993. The Brazilian Amazon has about 3.7 million square kilometers; according to one estimate, 70% of this area is forested and 30% unforested. Terre Firme forests can be defined as forested areas not influenced by rivers and tides, that is, the forests that stand in the mainland which is never flooded. Sometimes Terre Firme forests grow on extremely sandy soils where luxuriant and heavy vegetation frequently develops with a voluminous biomass. 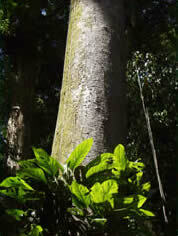 The average height of this kind of forest ranges between 30-40 meters, with sporadic emergent species which attain 50-60 meters in height, as is the case in the "cedrorana", "angelim", some specimens of "brazil nut" and so forth. Within the Terre Firme forest there is an extreme scarcity of light, and consequently the understory is poorly developed and rather clear; one can walk through such forest with ease. Robust vines reach the canopy, in some cases overloading the large trees, which cannot support the weight and consequently fall down, opening up a large clearing where the sun-loving plants can grow. In this kind of forest the tree trunks are normally rectilinear. Due to the lack of horizontal space, the crowns are of reduced size. There are many epiphytes, especially bryophytes and pteridophytes as well as species of the families Bromeliaceæ, Gesneriaceæ, piperaceæ, Orchidaceæ and others.